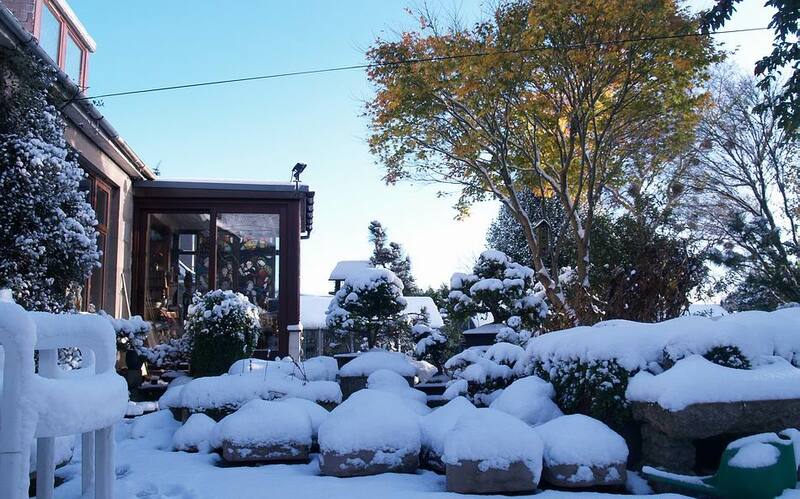 Last Wednesday when I flew down to Exeter in the South West,, to give a talk to the AGS Group the temperature in Aberdeen was 14C - the warmest place in the country when I arrived home on Friday evening it was snowing and the temperature was below zero. 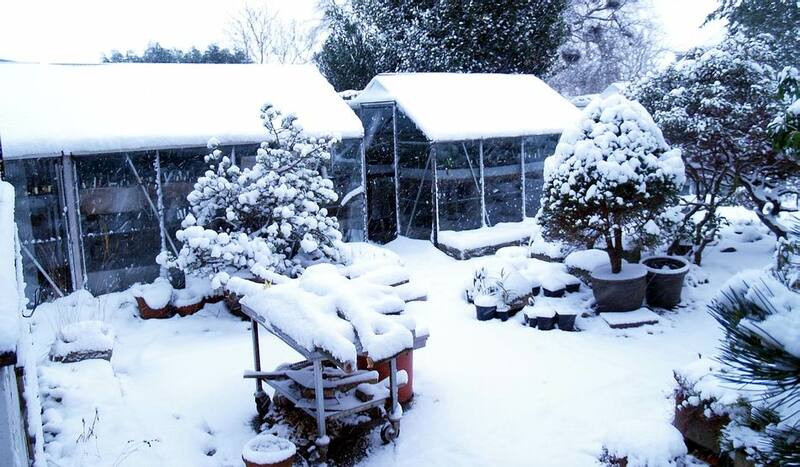 This was the scene as I got up on Saturday morning with about 9cms of snow covering the bulb houses. 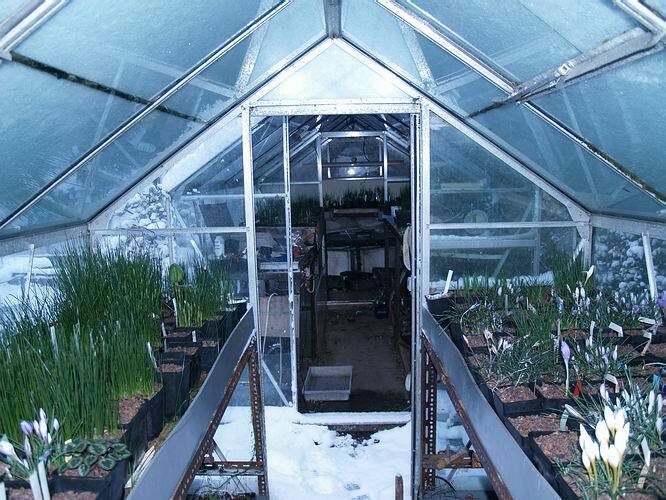 One of the reasons that we in Scotland can grow such a wide range of plants from around the world is our moderate climate but how much better it would be if we had consistent winters. If only the snow and cold came and stayed through December, January and February holding all the bulbs from trying to flower. 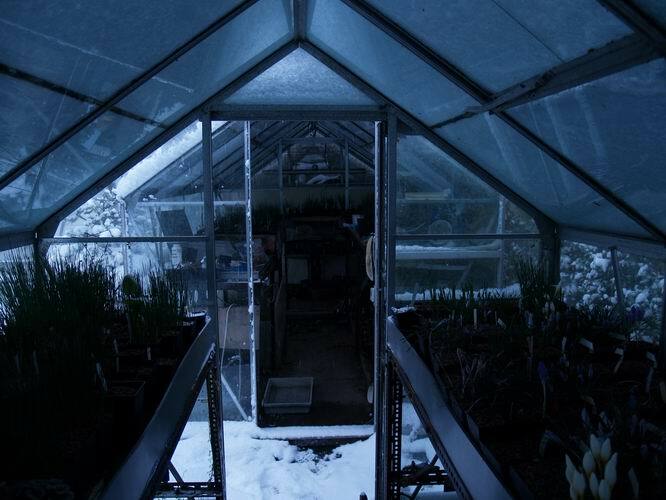 The main problem with the bulbs growing through these months is the extremely low light levels and short day length, not helped when snow covers the roof and excludes the light. 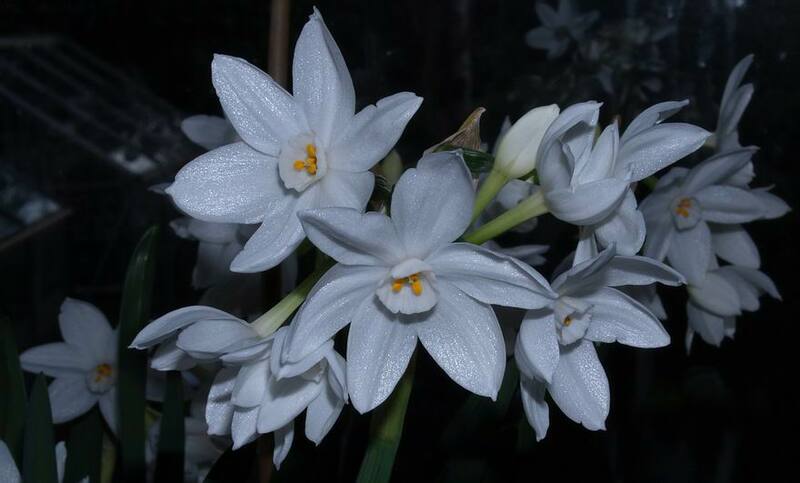 If I add a bit of flash to the same subject you can see how advanced many of the Narcissus now are and the flowering stems just keep growing upwards in the warm dull days. The other feature of our winter climate is that our mild days when the bulbs are encouraged to grow are always associated with heavy cloud cover and so very poor light and the brighter clear skies bring in the cold. The crocuses seem less affected by the poor light mainly because the autumn flowering ones are nearly over now and the fact that it is not their stem that pushes the flowers up but the extension of the floral tube. Despite the weather the first of the Narcissus are now just opening with Narcissus cantabricus foliosus always among the earliest to open - this is fully two weeks later than last year. 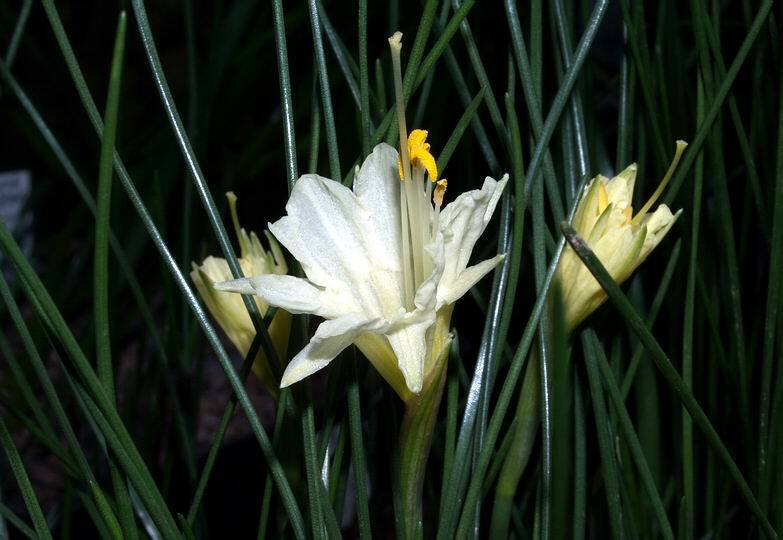 Don Stead's hybrid that I am calling Narcissus 'Joan Stead', has a deeply lobed corona and is also starting to bloom. 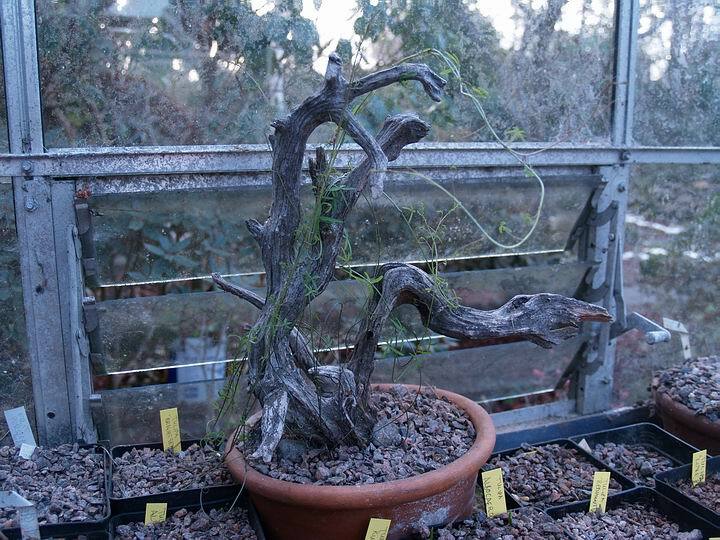 In the Fritillaria house our main plant of Tropaeolum azureum has been growing for nearly two months now and I am training it around a handsomely shaped piece of drift wood as a support. 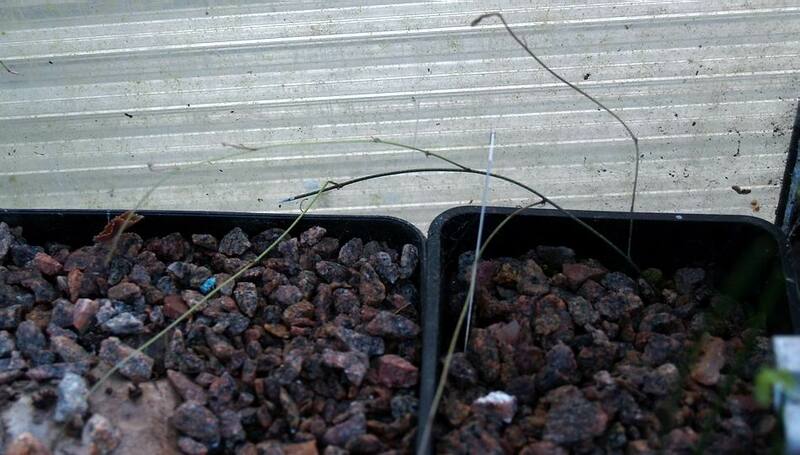 I have shown you before how I treat Tropaeolum azureum by pinching out the growing tip of the stem when it gets to around 7cms long; as you can see in this picture of another plant. Pinching out the dominant growth point stimulates the side shoots into growth and these will give me a much more bushy plant with many more flowers. In the centre pot you can just make out the new seedlings emerging from this pot of Tropaeolum azureum seeds sown two years ago - the stronger growth is from a seed that germinated last year. 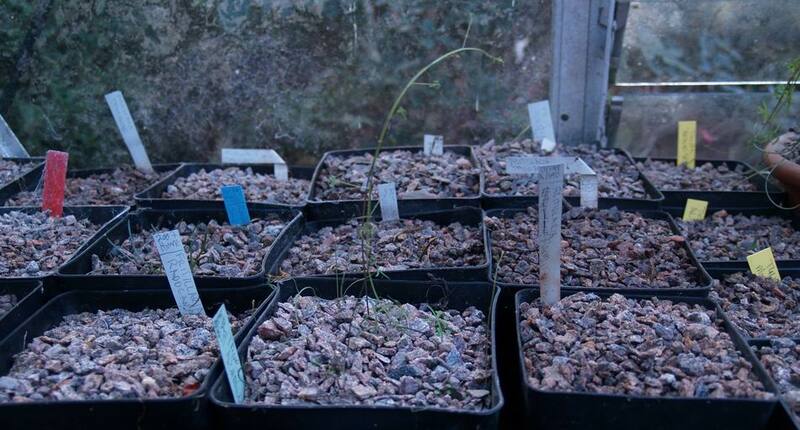 How Tropaeolum azureum seeds germinate is a total mystery to me - I have never found out how to get a consistently good germination- I always get a very sporadic germination over several years. It is not often that we get the snow when the leaves are still on the Acers but this is one of my own seedling Acer trees and it always holds it leaves well into November and along with the patchwork of snow covered, recently made and planted up troughs on the ground and the bright blue sky it makes for a lovely colourful scene. 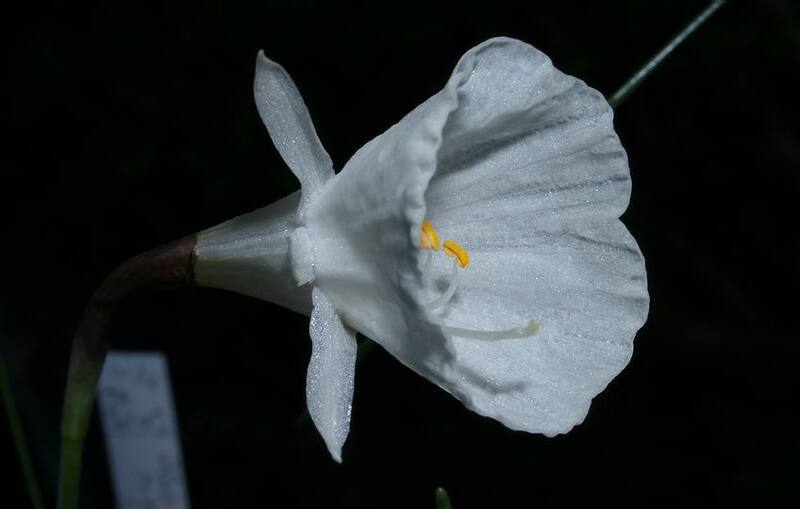 The little extension that you see faces south and it is in there that I bring pots of the very beautiful Narcissus papyraceus to open their flowers. I have to admit that I treat it as an annual- buying some new bulbs each year. I plant them up in pots which sit outside taking all that the weather throws at them until I see the buds appear down in the leaves then I can bring them into the heat which will stimulate the flower stems to lengthen and these wonderfully scented blooms to burst out. 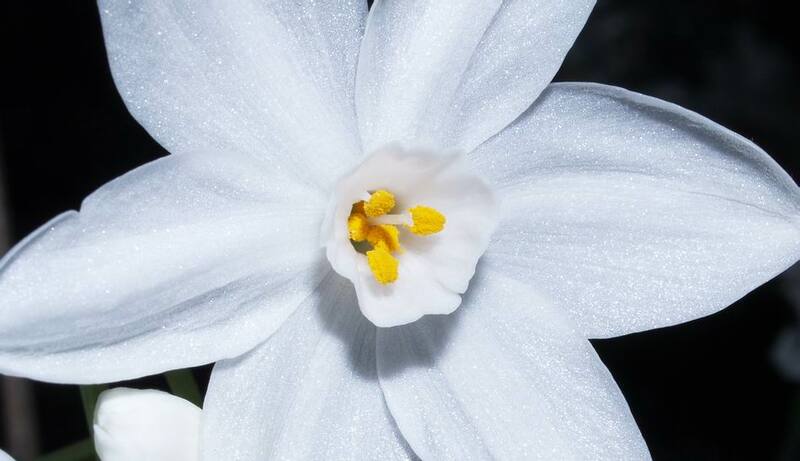 The detail of a single flower is stunning with its crystalline white petals surrounding the short corona which in turn contains the golden pollen laden anthers and with up to sixteen of these flowers on each stem it is a wonderful spectacle that also fills our kitchen with the most delightful scent. We had a further 9cm of snow fall on Sunday but then the weather changed and another front came through bringing rain and milder temperatures which moved most of the snow quickly to reveal the autumn carpet of leaves. 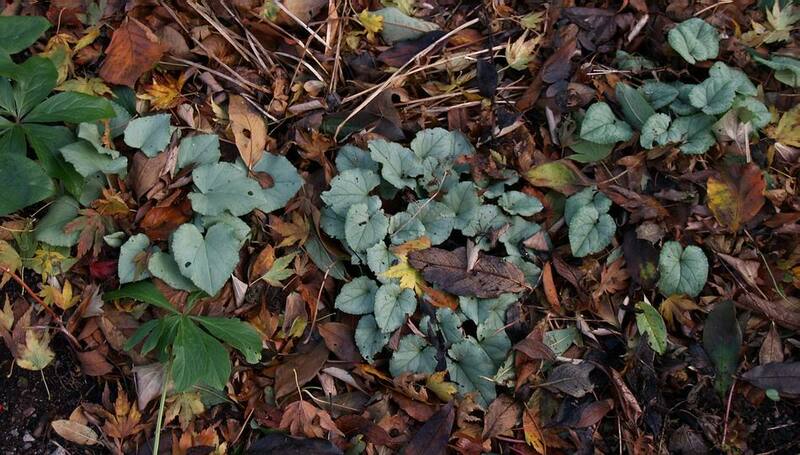 Even though they are a bit nibbled and chewed by slugs the silver leafed forms of Cyclamen hederifolium are well set off by the fallen leaves. 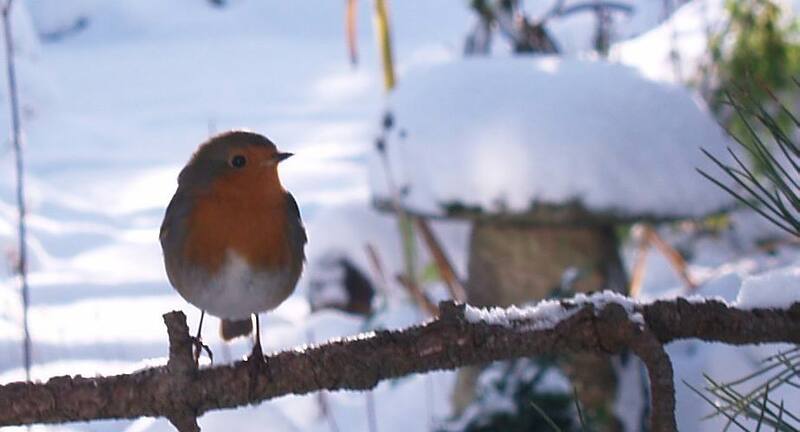 That is another good reason I wish for three months of cold winter - to reduce the number of garden pests such as slugs, snails and aphids which are finding life far too easy in the milder winters we are now experiencing. 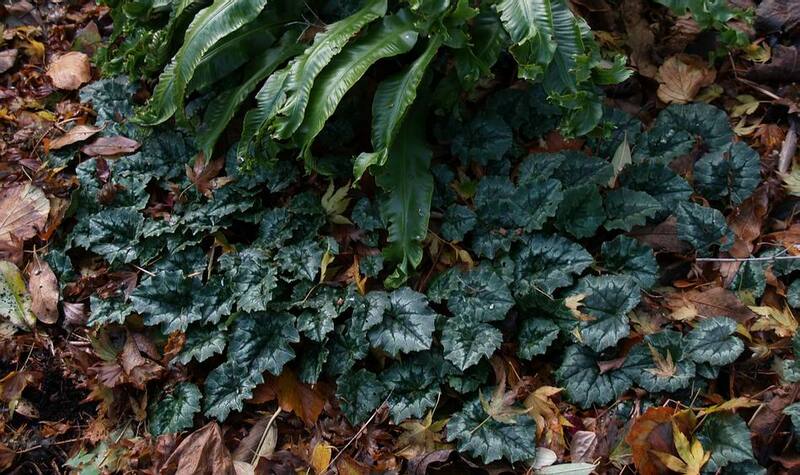 Another group of Cyclamen hederifolium contrast well with the shiny green Asplenium leaves and autumn's carpet. Both the fern and the cyclamen will stay evergreen until well into the spring when I usually cut off the ferns leaves to allow the new ones to emerge without having to compete with the old set - I just allow the cyclamen leaves to wither- this they normally do well into the summer by which time they look very chewed and tatty. A lone late flower of Crocus banaticus pokes its head up through the snow. 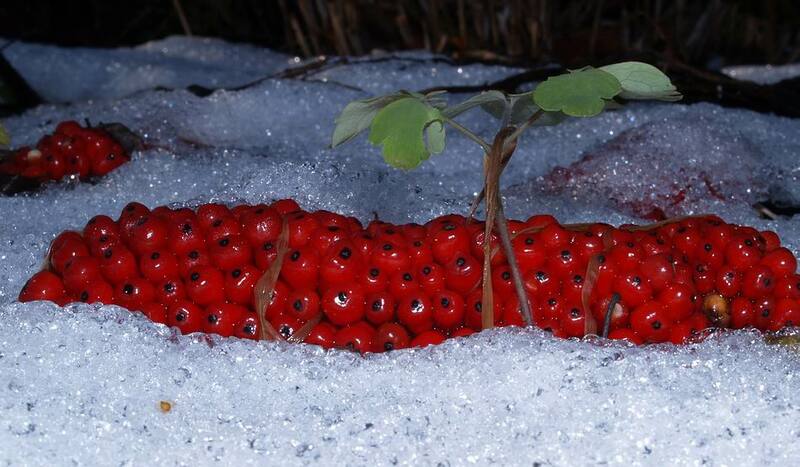 As the snow recedes it reveals the bright red Arisaema seeds still lying in the bed where they fell, making that very festive colour combination of red and white that we more often see depicted by that other winter star in the picture below- taken on Sunday.